Submitted photo “Jeremy’s Story,” a short video featuring Wright State student veteran Jeremy Dobbins, will premiere at the Dayton Veterans Affairs Medical Center on March 28. FAIRBORN — He joined the Marines out of high school and was deployed to Afghanistan, where he saw combat and death. It left a searing, indelible mark on Jeremy Dobbins, who would return home and enroll at Wright State University. It was at Wright State that Dobbins became involved in helping produce the Veterans’ Voices project, in which student veterans interview area veterans about their military experiences for radio and video clips that are preserved in the Library of Congress and posted on CORE Scholar. On Wednesday, March 28, “Jeremy’s Story,” a short video about the project, will premiere at the Dayton Veterans Affairs Medical Center. Produced by filmmaker John Kennedy, the video is designed to help showcase the Veterans Voices project. The event begins at 6 p.m. and is free and open to the public. 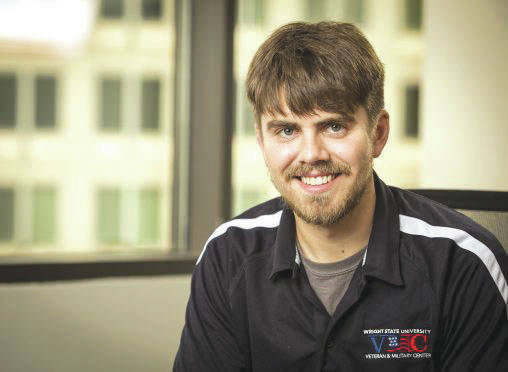 Veterans Voices is sponsored by Wright State’s Veteran and Military Center led by Seth Gordon. Dobbins says the project gives military veterans a platform to tell their stories and that it is historically important to collect and document battlefield stories. The event at the VA is titled “Our Path to Your Health: Jeremy’s Path.” It is sponsored by the Princeton, New Jersey-based Robert Wood Johnson Foundation, the nation’s largest philanthropy dedicated solely to health. The event will also feature the playing of a Veterans Voices interview with Army veteran J. Thomas Hardy, interim director of the Dayton VA.
Hardy began his Army career as an infantry platoon leader in the famed 101st Airborne Division, is an Army Ranger and completed 18 months in Vietnam as an adviser to a Vietnamese infantry unit prior to attending medical school in 1976. He served in leadership positions in both Europe and stateside prior to attending the U.S. Army War College from 1994-95. He then commanded Irwin Army Community Hospital in Ft. Riley, Kansas. The event will also feature a panel discussion about the importance of the Veterans Voices project and its process, a question-and-answer period and a call for other veterans to tell their stories. Veterans Voices also has a radio series, which is a collaboration between the Wright State Veteran and Military Center and WYSO Public Radio in Yellow Springs. https://www.fairborndailyherald.com/wp-content/uploads/sites/50/2018/03/web1_Jeremy-Dobbins-Veterans_Voices-73-508×372.jpgSubmitted photo “Jeremy’s Story,” a short video featuring Wright State student veteran Jeremy Dobbins, will premiere at the Dayton Veterans Affairs Medical Center on March 28.